On my Fashion Chart 2014 - BREVILOQUENT. Fashion believes in one thing - Constant Change. With 2014 closing, I have listed down the looks from off the runway to the street that I thought were my favorite. We all have our versions of these looks, we all have our way of carrying them. But we all have had our eyes on them the entire year. Rounding up the top 10 that remained up there for me. Last year’s infatuation with the crop top is back for another round and midriffs are having a skin-is-in moment. Bra tops, ruffled bandeaus and corsets have a distinct 1990s feel, especially when paired with high-waiste cigarette trousers. The crisp, menswear –inspired shirt enjoys a makeover with inventively cool, contrasting, color and/or textured collars with cuffs. This elevated wardrobe essential is perfect for sneakily kicking up your work outfit. Easy to wear and ultra-chic, wide leg trousers made a huge impact on the runways. This trend is not essentially for six-foot tall supermodels. Just look for a pair that is leaner on the flare and higher-waisted to elongate your frame. The voluminous ladylike silhouette is here to stay. While the midiskirt may be the ultimate transition piece, the tea-length, between midi and maxi is for spring/summer. Pair it with cropped tops to offset the length making you look taller. The classic white button downs have been reinterpreted this summer. Look for a necktie detailing, asymmetric cuts for a new spin. This season's peek-a-boo detailing is a mix of sweet meets sporty. This is one trend that just won't quit - that of the leg veil variety. Maxi dresses are summer's go-to dress length for parties, weekends and work. Swap your midis and minis for a long and loose spaghetti strap style that will take you from beach to bar with ease. Maxi dresses are the original summer-ready style item. If you're not big on getting your legs out - this is the dress to opt for. An athletic aesthetic took over the runways. The athletic stripe smartens up with tuxedo detailing on these spooky meets sophisticated tailored trousers. 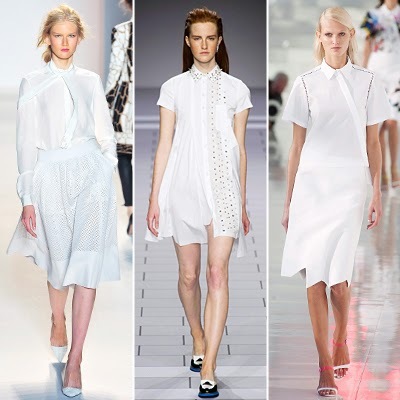 To keep the look modern but refined, opt for a streamlined silhouette in unexpected white. Depending on how you style this near-elbow-length-sleeved boxy top, the shift blouse could serve as a dressy tee or a casual-yet-hip blouse. It keeps the look flattering and versatile. Try exciting prints, textures and varying necklines. The boxy, cropped silhouette can come in plethora of prints and textures to pair easily with a fit-and-flair or body-con dress, tailored trousers, office-ready skirts and go-to jeans.